We are very proud to be grower-producers, only making our wines from the grapes that we nurture and grow ourselves. 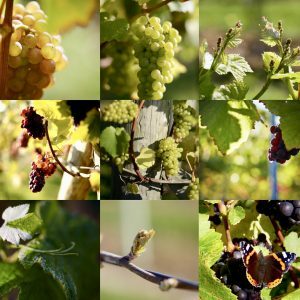 The four varieties that we cultivate are the red grapes Pinot Noir and Pinot Meunier, and the white grapes Chardonnay and Pinot Gris. To learn more about the grapes, the climate, the vineyards, soil and habitat that they grow in, and the characteristics of our recent vintages, please click on the dropdown boxes in this section.